It was a movie that caused the protests by the “folks” outside the US Consulate in Libya, and the protests that allowed miscellaneous evil doers who just happened to be walking by … at 9:30 in the evening — armed with mortars and RPGs, which are easily found throughout Libya — to take advantage of the moment, scale the consulate’s walls and kill the American Ambassador who was working there at the time. That this occurred on 9/11 was purely coincidental. So says Susan Rice, US Ambassador to the UN. I’m not sure why the US Ambassador to the UN was selected to be the spokesperson in this matter. What does her job have to do with Libya, or the consulate or other matters of State? Shouldn’t it be some State Department person, someone in the chain of command relative to embassies and consulates that was chosen to make the statement? No matter, that is what she’s said, as reported by Fox News today. In the same article, Fox also reported that an intelligence source on the ground claimed there was no protest outside the consulate at all that night, despite our own government’s insistence that there was. “There was no protest and the attacks were not spontaneous,” the source said, adding the attack “was planned and had nothing to do with the movie.” According to this source, the attack came without warning, with firing originated in two separate locations. This corroborates an earlier report from McClatchy of an unnamed Libyan security guard who alleged the same thing. “There wasn’t a single ant outside,” he said. The Obama Administration rejects both sources, as well as the Libyan president’s claim that this was a planned out attack, a view the Obama administration says is not consistent with “the consensus view of the U.S. intelligence community,” which has been investigating the incident. Except… recently we were told that the situation in Benghazi had been turned over to the FBI to investigate, because it was now regarded as a crime scene. There could be no further talk on the matter beyond whatever the FBI was willing to reveal — not what happened, not who was involved, not the condition of Ambassador Stevens’ body… nothing until the Justice Department’s investigation was completed. Unfortunately, the FBI agents haven’t even gotten to Benghazi yet, because it was decided the area was too unstable for them to enter. So… who is investigating? And how can the US say that the President of Libya, who is in Libya, doesn’t have the same “data collection potential that we have,” when our agents haven’t even gotten there yet?. “A consensus view of our intelligence community” just means the majority opinion, not eyewitness testimony or any kind of hard facts. And majority opinion isn’t always right. In fact, I’d say it’s rarely right. And how is our “data collection potential” relevant to all this? “Potential” means we haven’t collected it yet, otherwise it would be real not potential. So really, all the administration has said in defense of it’s theory is that they’ve voted on the best guesses of what really happened, and since the US’s ability to gather data is so much superior to Libya’s, eventually the data we’re going to collect will support the majority-opinion guess. Which means, the US official really didn’t say anything. So why did I write an entire blog post on this? Because the dissembling fascinates me, especially when I notice it. I grew up with the notion that those in authority don’t lie. Perhaps bend the truth. Or leave certain things out. But not outright lie. Even having blogged about the doctrine of taqiyya, I still find it hard to believe that people actually do it. But in a society like ours, where we don’t believe in such things, where a man’s word was once his bond, and honesty is still mostly considered a virtue, it’s harder still. I know all politicians lie on some level or other. I know it. But I think I still don’t totally believe it. Otherwise why would this stuff surprise me? Maybe because it’s so obvious and how can they think we all won’t see it? Do they think we won’t care. (Granted a far too many of our citizens don’t seem to.) And yet the media just reports it all as if it’s truth, as if it’s not the least bit inconsistent, and certainly not that it’s reprehensible. It seems like it should be against the law for government officials to lie like this, so easily, so blatantly… Because the result for me right now is that I have no idea what is truth and what is lie. Are the Intelligence “Source” on the ground and the unnamed Libyan security guard lying? Could be. The President of Libya? Yeah, he could be lying, too. The US administration official? The US ambassador to the UN? Obviously. Everyone’s clearly scrambling to cover their rears… It would be funny were it to show up in some comedy movie. But it’s not a movie. How can we, as supposed-to-be-informed citizens ever know what’s actually going on, when everyone seems to be lying? All the time. When one lie doesn’t work, they just float another… Where is that all going to lead? I don’t have answers for these questions, but I do believe that this is one more thread in the unraveling of a culture once based on Biblical standards, now steadily heading down the road to destruction. This entry was posted in Cosmic System, Current Affairs, Islam, Last Days and tagged ambassador, FBI, Islam, last days, Libya, lying on September 17, 2012 by Karen Hancock. A couple of days ago, after my 15 minute increment of wrestling with ch 1 — which had problems I couldn’t seem to even get my mind around, let alone resolve — I went to Drudge and clicked on a link to see what was going on with the riots in England. After a cursory glance at the photos, I was about to click away without reading anything, when I believe the Holy Spirit said to me, “Karen, you are writing about a riot in Ch 1 and this is real-time info on rioting.” I blinked at the screen. Whoa! What a doofus I am. So I read about what was going on, looked at photos, and listened to the two drunken girls gloating as to how they’d gotten to “show the rich we can do whatever we want.” By now many of you have probably heard of that. 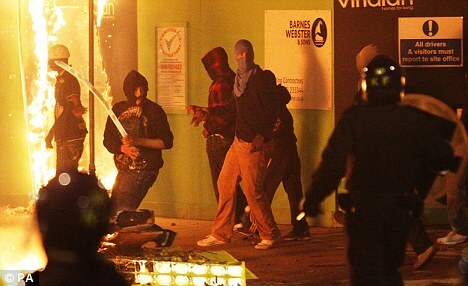 The next day, the riots being on my radar now, I was very interested in a piece Rush Limbaugh brought up by British commentator Max Hastings in the UK Daily Mail Online called Years of liberal dogma have spawned a generation of amoral, uneducated, welfare dependent, brutalised youngsters , August 10, 2011. It’s a fascinating article, some of which I’ve lifted to share with you, though I recommend you read it in entirety. Hastings starts out as many have, trying to figure out why these people are doing these things. The first riot came out of a protest over the shooting of a local man, which as facts came out did not seem anything worthy of protest. People who break into shops and run out with armloads of iPods and other goodies do not seem to be focused on the injustices allegedly done to one of their own. Anyway, I found Hastings’s comments fascinating, not only in their own right, but for the condition he related might be used in this novel I am currently writing. It’s amazing how much this fits with what I’m doing. So, on with Hastings, who is as I said, attempting to come up with a reason to explain the rioters’ actions. “Of course it is true that few have jobs, learn anything useful at school, live in decent homes, eat meals at regular hours or feel loyalty to anything beyond their local gang. This is not, however, because they are victims of mistreatment or neglect. It is because it is fantastically hard to help such people, young or old, without imposing a measure of compulsion which modern society finds unacceptable. These kids are what they are because nobody makes them be anything different or better. “A century ago, no child would have dared to use obscene language in class. Today, some use little else. It symbolises their contempt for manners and decency, and is often a foretaste of delinquency. If a child lacks sufficient respect to address authority figures politely, and faces no penalty for failing to do so, then other forms of abuse — of property and person — come naturally. A key factor in delinquency is lack of effective sanctions to deter it. From an early stage, feral children discover that they can bully fellow pupils at school, shout abuse at people in the streets, urinate outside pubs, hurl litter from car windows, play car radios at deafening volumes, and, indeed, commit casual assaults with only a negligible prospect of facing rebuke, far less retribution. He spends a few paragraphs detailing the troubles various authority figures — from adults in general to teachers to policemen — have in attempting to control their behavior. So there we have it: a large, amoral, brutalised sub-culture of young British people who lack education because they have no will to learn, and skills which might make them employable. They are too idle to accept work waitressing or doing domestic labour, which is why almost all such jobs are filled by immigrants. They have no code of values to dissuade them from behaving anti-socially or, indeed, criminally, and small chance of being punished if they do so. They have no sense of responsibility for themselves, far less towards others, and look to no future beyond the next meal, sexual encounter or TV football game. They are products of a culture which gives them so much unconditionally that they are let off learning how to become human beings. My dogs are better behaved and subscribe to a higher code of values than the young rioters of Tottenham, Hackney, Clapham and Birmingham. As I said, I recommend you read the entire article HERE. This entry was posted in Current Affairs, End Times, Novel development, Uncategorized and tagged End Times, feral children, last days, London rioting on August 11, 2011 by Karen Hancock.